Every field on the order form is required. Please, take care when filling out the form, because after submission, data can only be modified through our customer service. 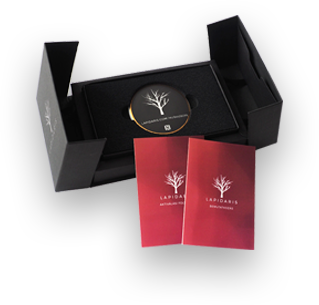 If you wish to register more than one departed to one gravesite, you can do that after ordering and activating the Lapidaris Stone, by signing into your personal account. The Lapidaris system is currently limited to Hungary. In which county is the resting place of the departed? Required field. In which city/town is the resting place of the departed? Required field. In which cemetery is the resting place of the departed? Required field. Your name, or the name of the person who will activate the profile. Required field. This is the e-mail address we will send confirmation e-mails to. Also, this is the e-mail address you can use to log into the Lapidaris system. Required field. Your contact number. We will forward this number to the delivery company as well. Required field. Payment is due at the time of delivery. Payment via bank transfer. We will send you an e-mail with further instructions after the order has been placed. Comfortable and secure payment is ensured by BARION Payment Zrt., which is an institute supervised by the Hungarian National Bank. Name of recipient. Required field. The recipient's ZIP/postal code. Required field. The recipient's city/town. Required field. Shipping address (street, house number, floor, door). Required field. This is the name the purchase invoice will be made out to. Required field. The country of the billing address. Required field. The city/town of the billing address. Required field. The street, house number, floor, door, etc. of the billing address. Required field. I hereby confirm that I have read the Terms and Conditions, understand my obligations and responsibilities regarding payment and shipping, and agree to be bound by these terms. I further acknowledge that sending this form qualifies as an order.